Today I'm posting for Team Thursday with Impression Obsession. I hope you've had a chance to visit the Blog Hop the Team has had this week featuring many of the new IO dies! If not, there are three days of inspiration and even prizes for you to enter to win in the previous posts. Today however, I'm back to stamping and coloring for the holidays! I LOVE to color; in most any kind of medium. But today I'm sharing two Copic colored Goose cards. 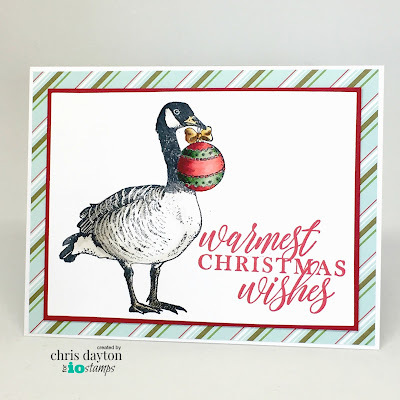 My first card features Christmas Goose. This is a large image, with lots of pretty floral and foliage elements. It's a fun one to color. It is stamped on Hammermill Digital Color Copy Cover 80# paper with Memento Tuxedo Black ink. I used a variety of Copic green shades to create contrast with the bright red poinsettias. The goose was colored with a mix of the E40's and warm grays, with the constrasting gold bow created with the Y20s, and a hint of sparkle from a Spectrum Noir clear glitter brush marker. I added a dark pine green and red polka dot strip to the bottom of my card, and added the Merry Christmas sentiment from Holiday Words with gold embossing powder. My next goose themed card features the stamp, Holiday Goose. Again I have stamped in Memento and colored with Copics. 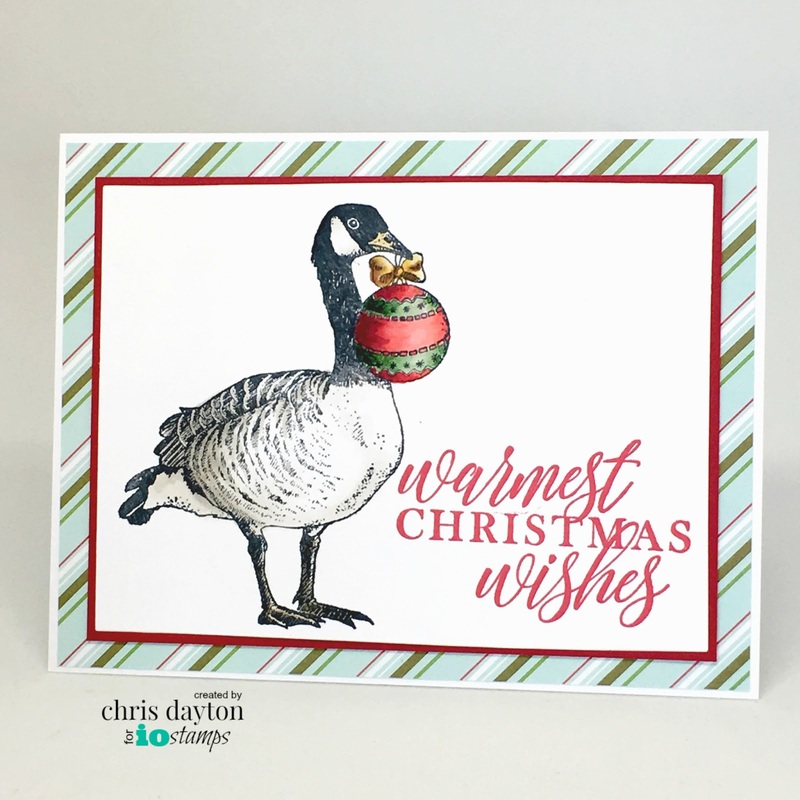 The goose is colored in warm grays and the ornament in R20s and G20s. Again I have used a technique to create a shimmery gold bow with Y20s and Spectrum Noir glitter brush marker. The Warmest Wishes sentiment is stamped in a bright holiday red ink, and the colored panel trimmed and matted with red and a holiday stripe patterned paper. Scroll down to the previous post to check out the IO Die Hop! OMGoodness these are so gorgeous...wow, love them! Color choices are amazing! Your cards are gorgeous! What a fantastic, beautiful job on the goose! Just lovely!